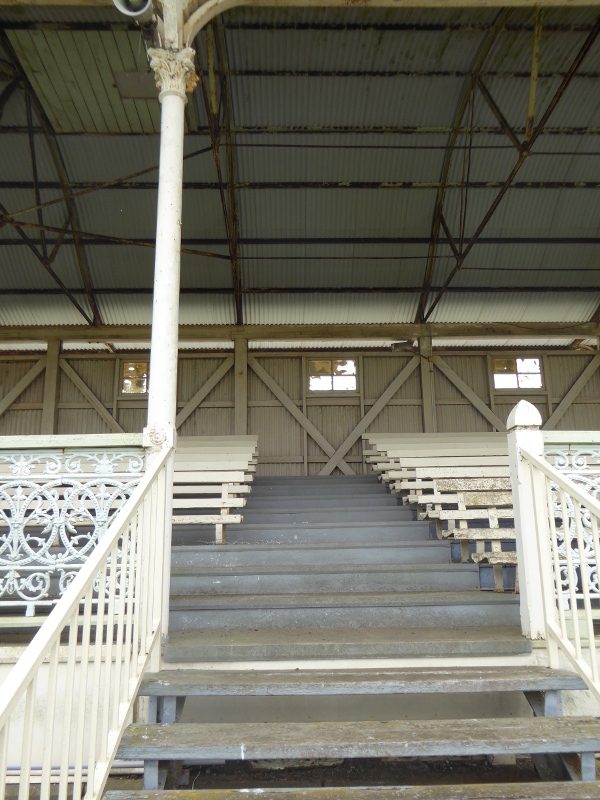 There’s a real vintage grandstand at Hamilton racecourse. 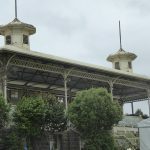 Built in 1873, it’s looking a bit tired now, but such a nice fixture on this beautiful race track in the west of the state. 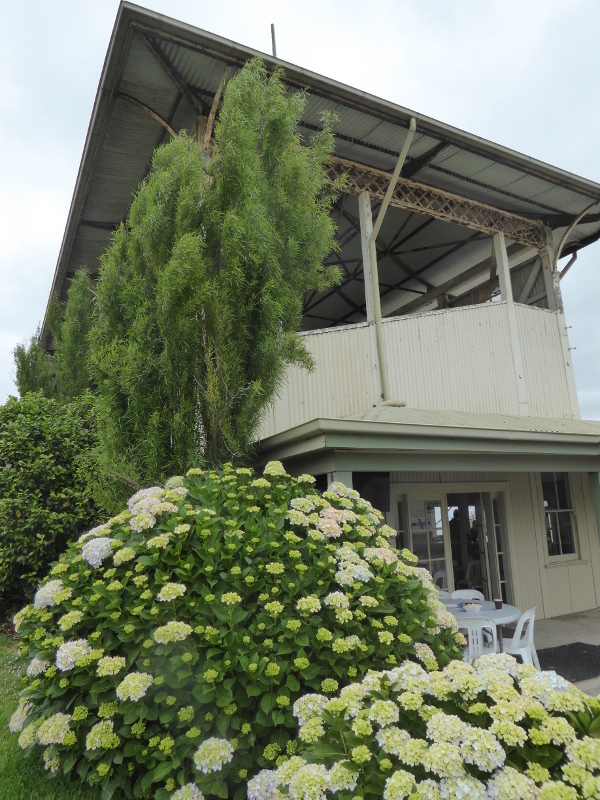 I came to Hamilton Racecourse for its vintage grandstand, built in 1873, but this became just a lovely day at the races mingling with the crowds of primary school kids on summer term trips and groups of adults with learning disabilities on a wonderful NDIS-supported day-out. I even met the Mayor of Hamilton! 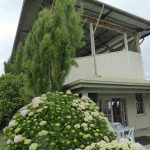 There was a vintage feel to Hamilton Racecourse even in the car park, as a horse-drawn carriage was taking people up and down the driveway from the main road to the entrance. 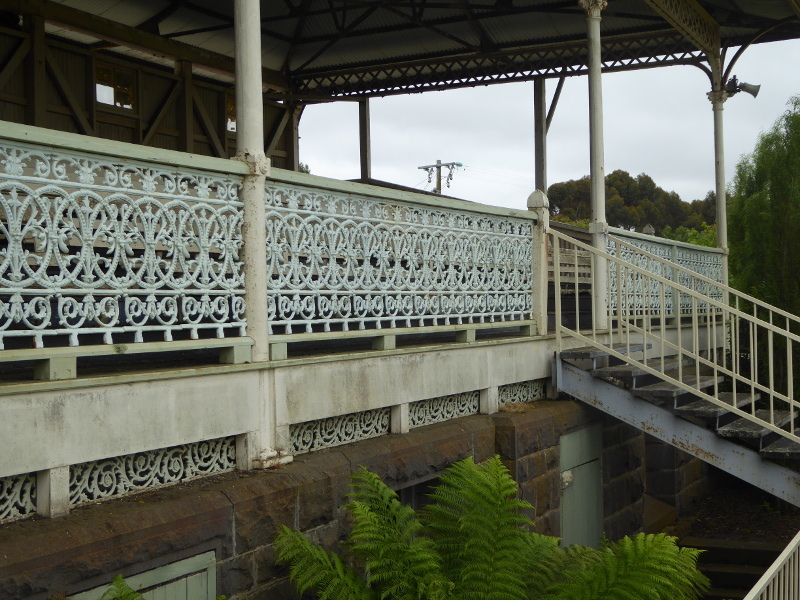 And I guess this may well have been the way the wealthier folk of the area got to the track in those early days, so some authenticity to it. 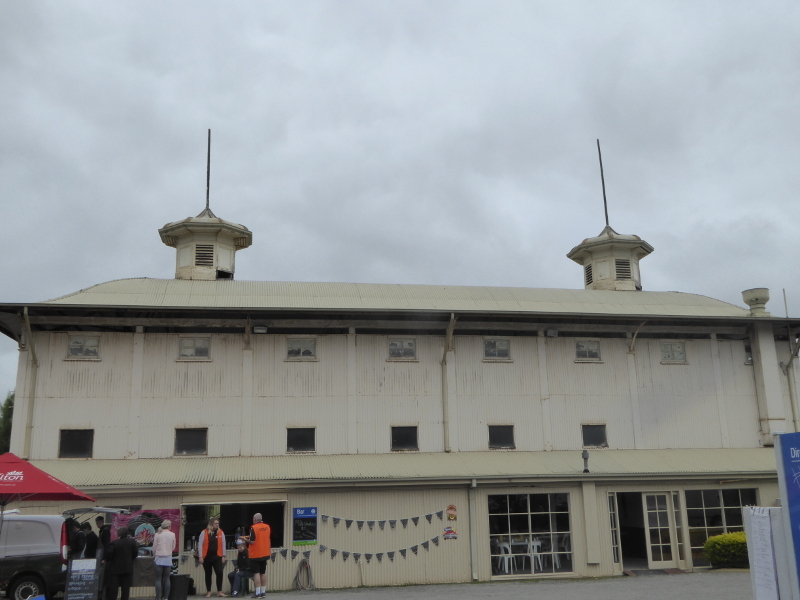 The grandstand had a marquee right in front of it, which slightly marred my views of the whole building from the front, but it was a good spot for the kids to leave their bags while they raced around doing other things. 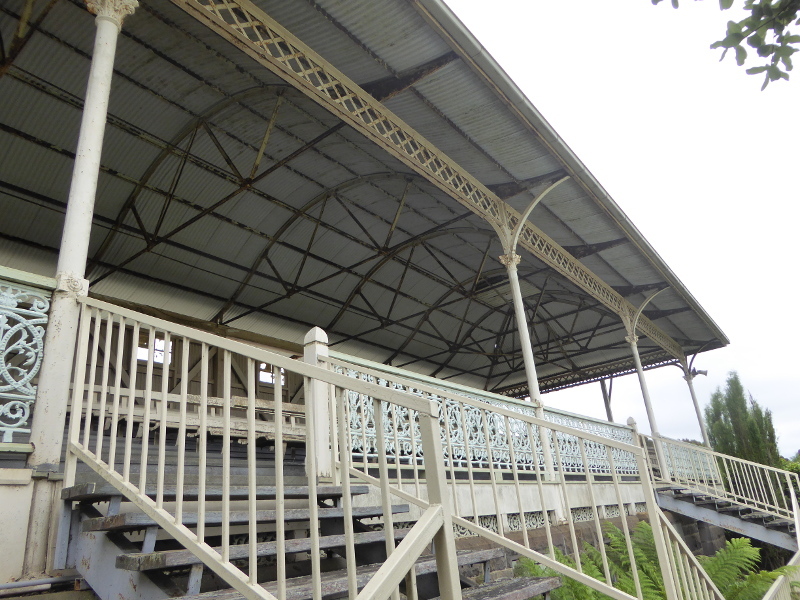 It’s looking a bit tired now, kind of shabby chic, with wobbly planks on the stairs, paintwork that’s fading, and rusty metalwork holding the roof on, but it’s a beauty, and I’m so glad Hamilton Racing Club preserved it for racegoers 145 years on from its birthday. 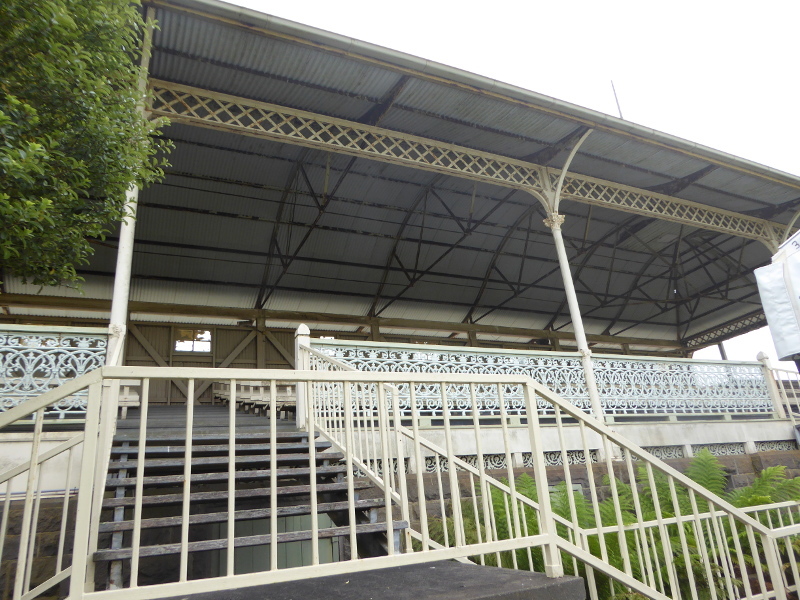 The school kids certainly loved charging en masse up those stairs for a view of the races, and then spilling down to the lawns again for another race or chase in between the events. 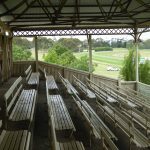 I read on the Heritage Victoria site that some of the iron bases to the seating in the grandstand may well be original, so there have must have been a lot of bums on those seats over the years taking in the views and cheering on the horses from those pews. 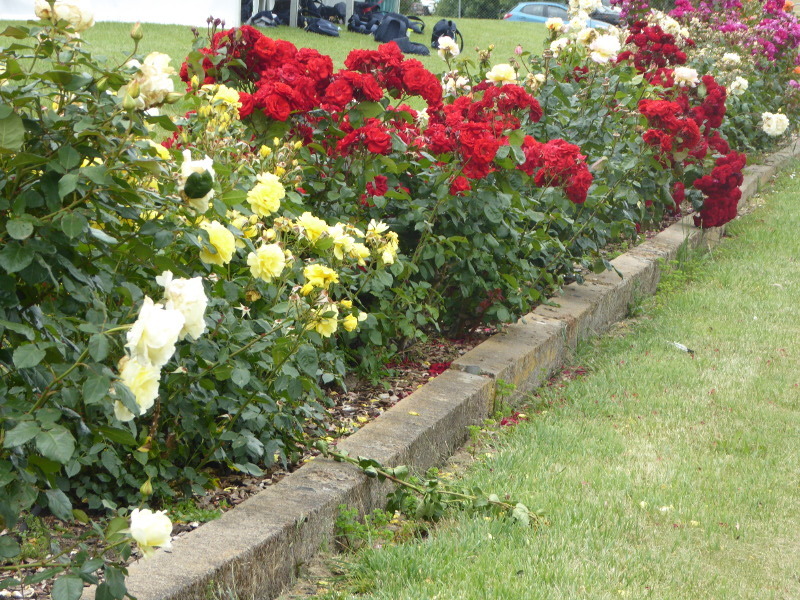 The course is a pretty one in any case, with flowers strategically placed to add a bit of colour, a line of roses in front of the grandstand, and some impressive hydrangeas to walk past as you climb the staircase. 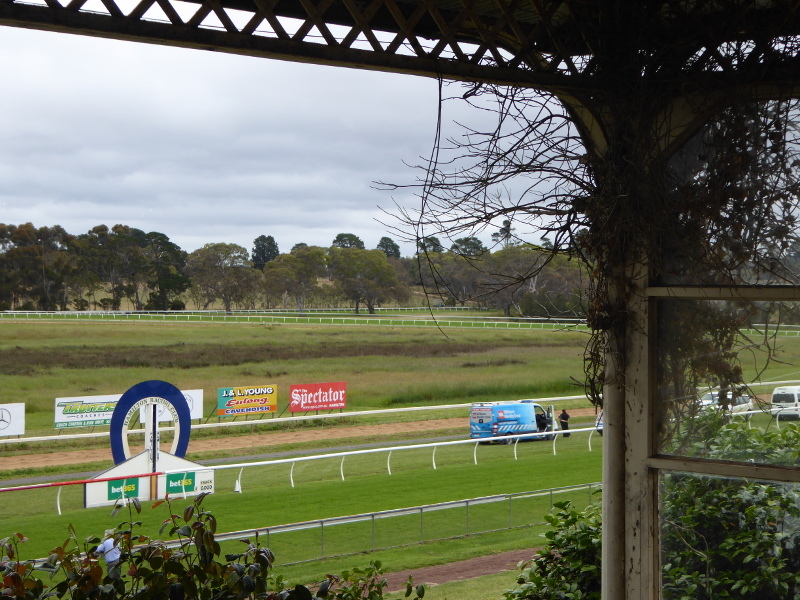 Funnily enough, after the crowds had left half way through the meeting, the course was quiet and you could hear the birds screeching in the gum trees over on the far side. 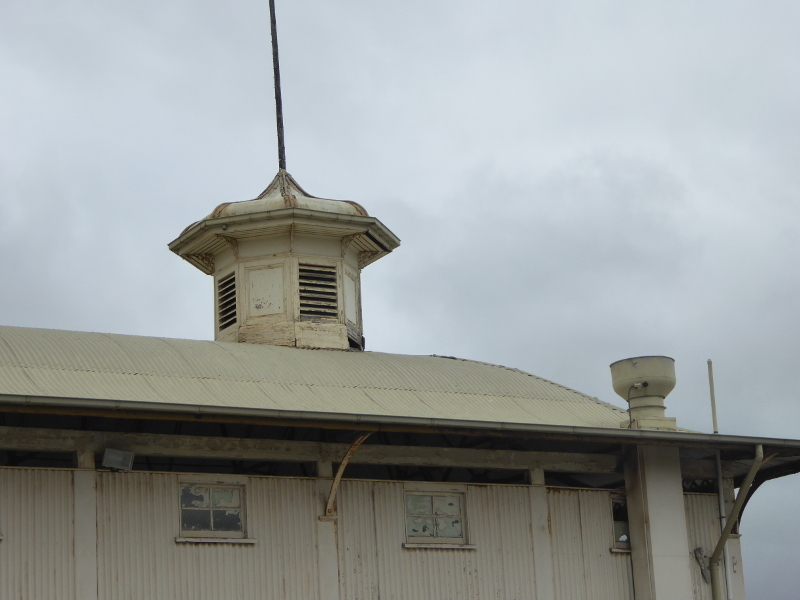 There was even a laughing kookaburra out beyond the stables who drowned out the announcements for a minute or so. 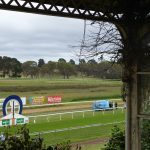 But almost as much fun as watching the horses was the Fashion in the Field event, which I know from my trips to country racing in South Australia is a classic part of days at the races still in Australia. 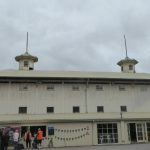 There were four categories, divided by gender for kids and for adults, and it attracted a lot of participants, especially among the NDIS crowd. The judging was done by Hamilton’s Mayor and by the guy who had won it for the last three years, and this year was sporting a kind of Cat in the Hat blue top hat and suit. He would probably have won his category again, so it was a canny move to get him to judge instead. 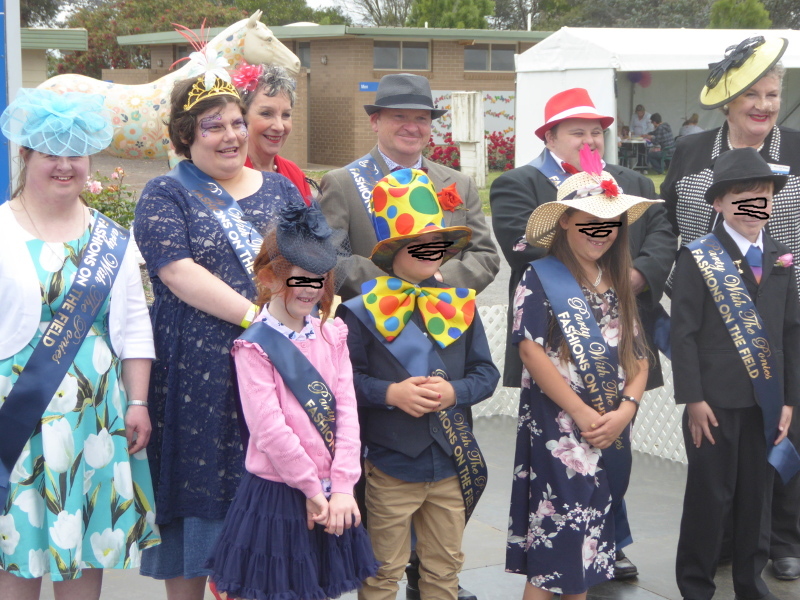 My favourites were the boy in the big clown’s bow tie and hat, the row of (very vintage) 1920s gangster lookalikes among the men, and the man in full Scottish regalia, kilt sporran and all. And the best moment of all was the woman who won one of the awards so excited she high-fived the Mayor. I was so impressed with the overall vibe and the benefit this outing was giving to the groups of visitors that when I saw the Mayor and the local radio guy – Ace Radio had sponsored the event – chatting afterwards, I had to go up and congratulate them on the initiative. 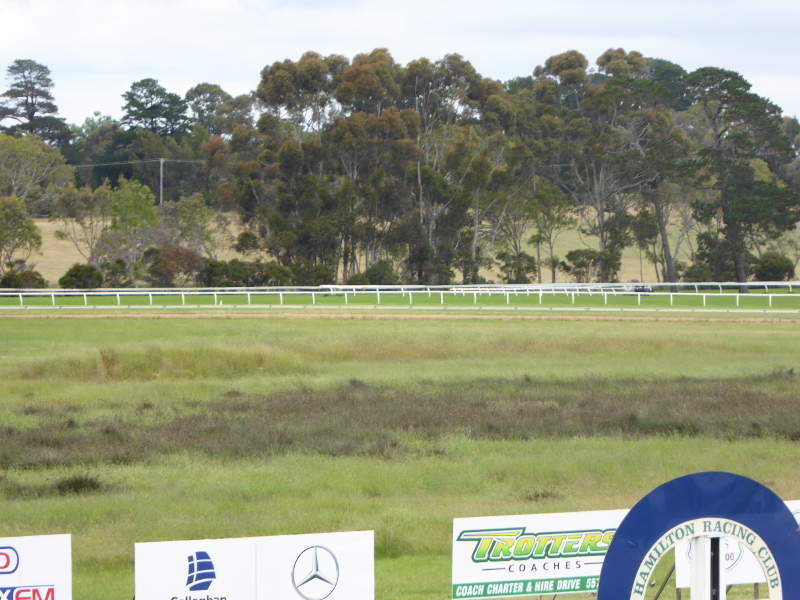 It’s what country racing is all about, I think. 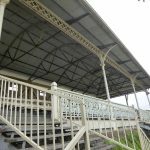 The Mayor encouraged me to visit also the cricket oval in Hamilton, which apparently also has a grandstand of a similar vintage. 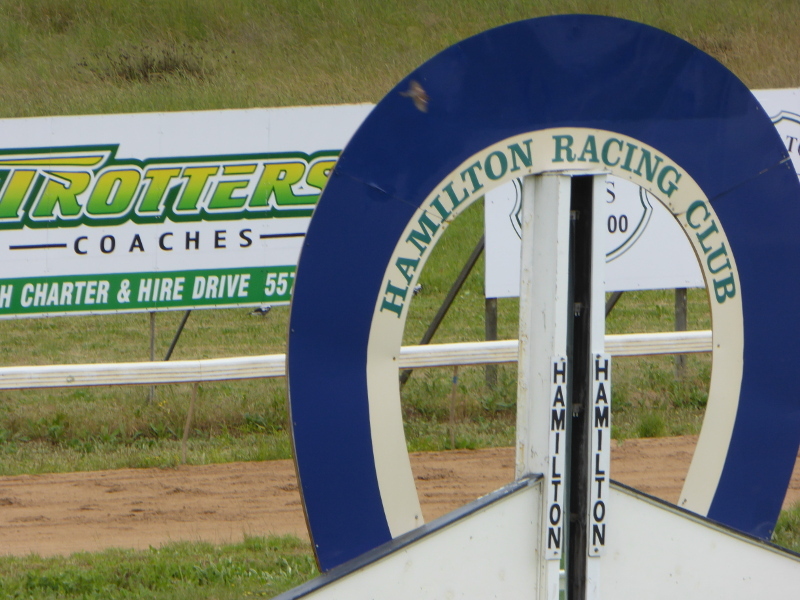 I will probably get onto ovals one day, but for now I have my hands full with the categories I am pursuing on Vintage Victoria, and Hamilton Racecourse made for a perfect entry. The entrance gate had a sign suggesting it would cost $20 to get in, but for Party with the Ponies day it cost just $8 plus $5 for the racebook. Hamilton is a big circuit, about 2kms round. 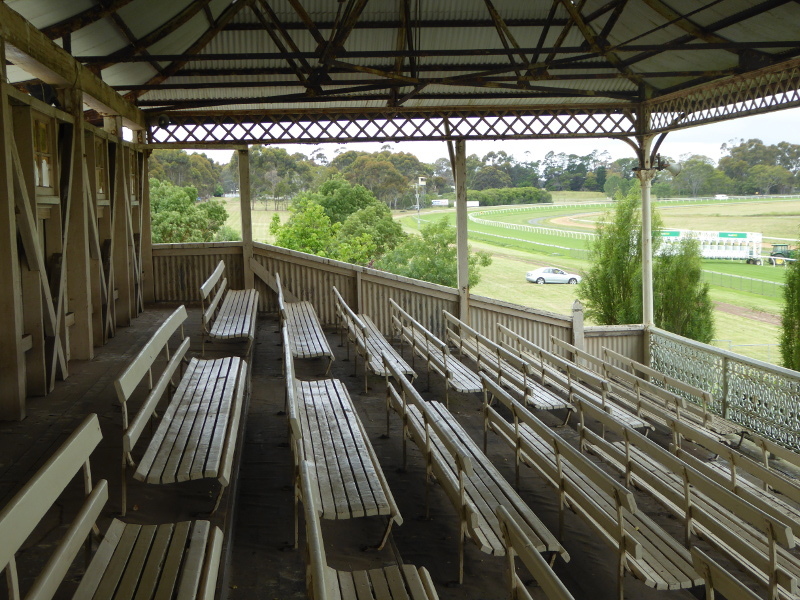 The 2200m start was just to the left of the vintage grandstand. 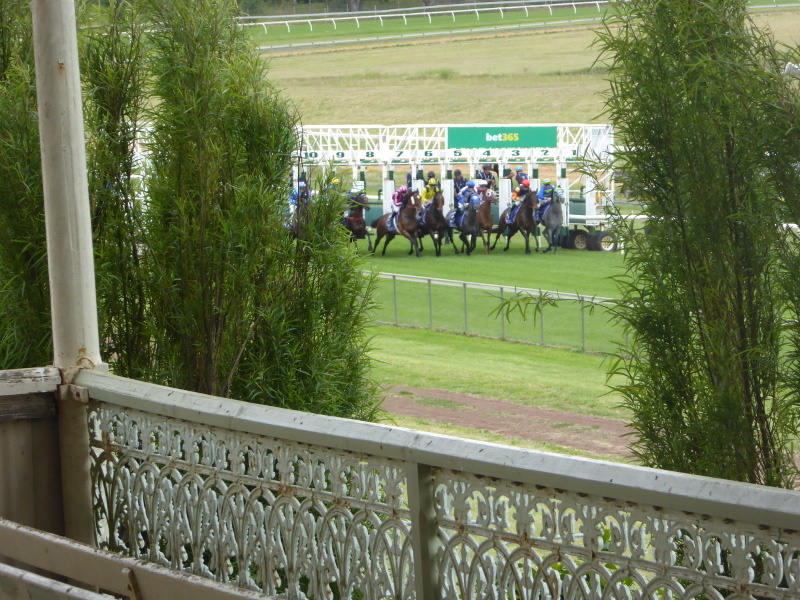 He called the racecourse ‘the best-appointed country course’ he had ever seen. The scratching board he called a thing of beauty and mechanical ingenuity; it was a personal invention of the course secretary, a Mr Gummow. 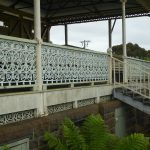 I’d love to know how it looked, but sadly there’s no sign of it now. 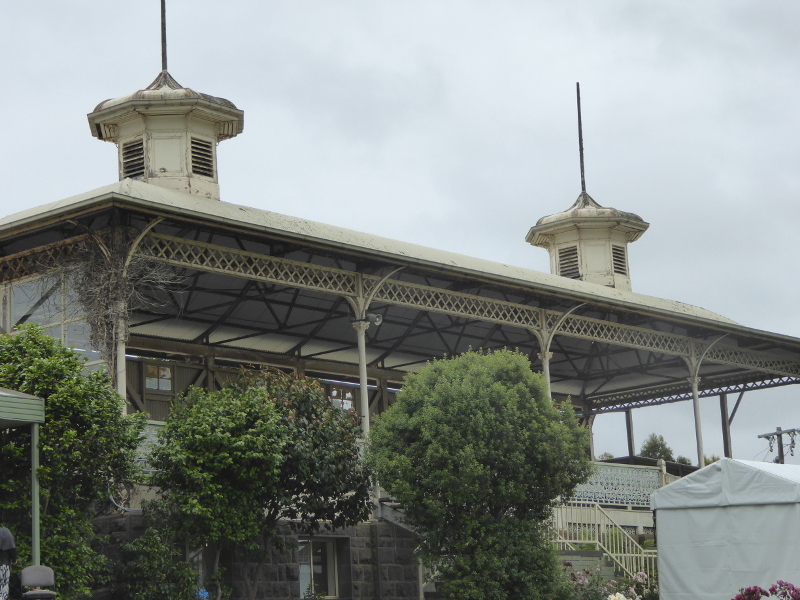 He was less impressed with the quality of the racing or the horses sold at auction afterwards…There were references to war, both with news posted on the course about the Boers, and in describing the racing as not matching the ‘keen competition’ between Boers and Brits on the battlefield! I was also interested to see a big debate in the 1950s around legalising off-course betting, with SP (starting price) betting still not legalised for off-course betting. 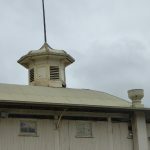 It’s interesting because another search had shown an interview with a retired Auditor-General of Victoria (John Alexander Norris) who remembered that one of his first jobs – much earlier maybe even before 1900 – had been to open the first telegraph office at Hamilton racecourse for SP betting, and very popular it had been, he reported. 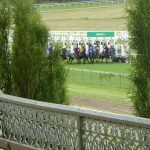 What are your experiences and stories from a day at Hamilton Races? 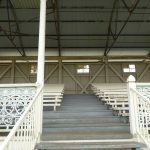 Anybody got nice memories of days out sitting in the old vintage grandstand at Hamilton? Does anyone remember the old scratching board and how such an apparently ingenious invention worked? When was it finally removed? 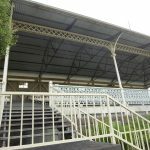 This link goes to the Victorian Heritage Council report on that 1873 grandstand at Hamilton. 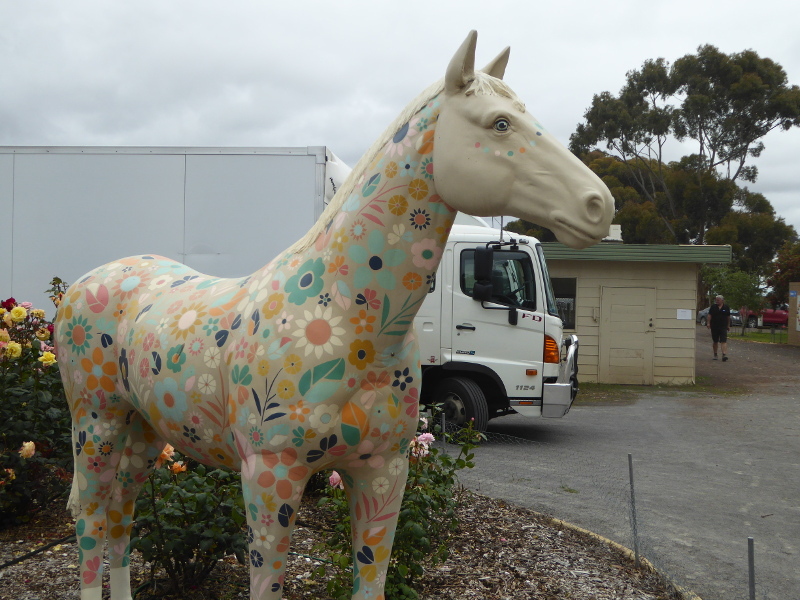 This Country Racing website post explains more about the Party with the Ponies day. Java Jive coffee van is at every Hamilton race meeting, and this was an excellent coffee, better than most brews you’ll get off the back of a van. Back in town the best coffee in Hamilton seems to be at Tosca Brown’s. Prodigy Coffee served up in a rustic (exposed bricks and shabby chic plaster on walls) café.